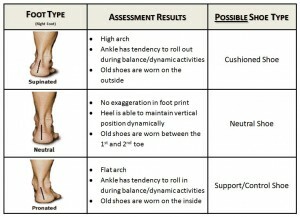 Assessing your static and dynamic foot type can be difficult, but it seems simple when compared to the complexity and confusion associated with selecting the right shoes for your feet.This post will be focused on shoe selection and how to use information from the parts 1 & 2 to help you choose the right shoes. Basic selection starts with finding which “group” your feet belong to. Using the previous 2 posts you can attempt to classify your foot type as either a supinator, neutral, or pronator. Within each category there is a continuum from minimal, moderate, to severe. Each different foot type is going to have a corresponding shoe type. Shoe companies have come a long way since the one-size-fits-all flat soled shoe. While Converse still has a place in punk-rock bands and hipsters, it is fairly conclusive that these type of flats are not the best for athletic activities. Today there is a plethora of shoes available to accommodate just about every possible foot types. Walking into a shoe store can be confusing with all the different companies and characteristics. But to attempt to keep it simple, just look at 2 characteristics: pronation control and features. This is the most important characteristic to consider when choosing footwear. You want enough support to prevent any ankle instability or over-pronation, but not too much support to where it limits your normal foot motion. 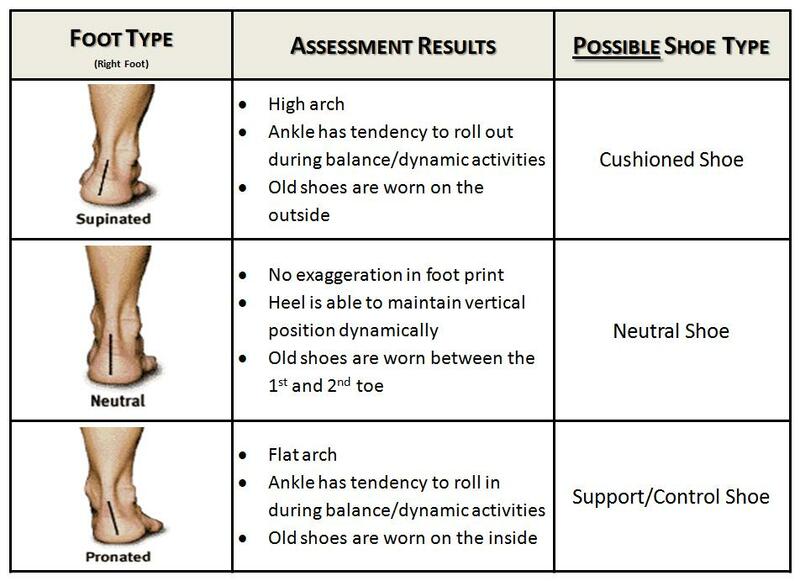 The midsole of the shoe is usually the predictor of how much support/control the shoe provides. This is where the shoe companies often times try to separate themselves with the “latest technologies and innovations”. Regardless of what the shoe companies are selling, the function of the features is always the same. It comes down to how much and what type of cushioning system the shoe has. The trade off here is that the more cushioning a shoe has, the heavier it is. Therefore, it is important to find the right amount of cushioning for your comfort and support, but not too much to where you care carrying unnecessary weight. This table will hopefully provide an idea of what shoe type might be best for you. Each individual has a unique foot type and therefore simply categorizing yourself into a 1 of 3 category is not always the answer. It all comes down to the proper fit, support, and comfort. Hopefully this table will give you a place to begin your search. Wear your shoes in slowly. Try wearing them around some before going for a long run in a brand new shoe. This can possibly prevent some pain with the change in footwear. Hopefully this 3 post series provides some information and understanding to the confusing world of footwear. As mentioned above, there are many factors to consider when choosing which shoes are right for you. Even if these posts do not lead you to the perfect shoe, I hope that it will at least prevent you from running in the wrong shoe.